Are you fascinated with Chinese culture and love film? 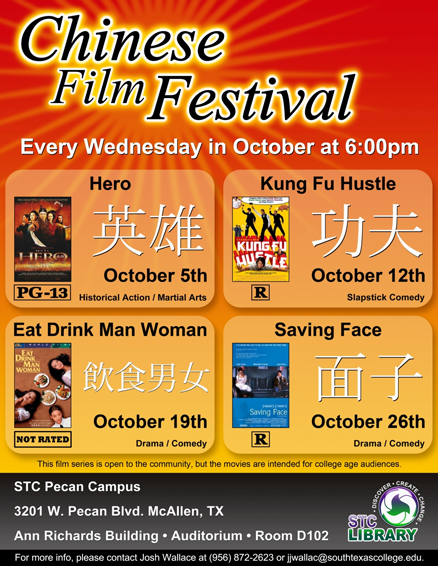 If so, or if you just want to try a taste of Oriental film, South Texas College’s Pecan Campus Library is sponsoring a Chinese Film Festival throughout the month of October. 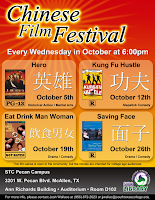 Every Wednesday night in the month at 6 p.m. a different Chinese movie will be shown in the Ann Richards Administration Building Auditorium located at 3201 West Pecan Blvd. in McAllen. Admission is free and open to the public. “Due to its immense size and rapidly growing economy, China is always in the news and this is an opportunity for STC students, faculty and staff and community members to learn more about this fascinating country. It’s also an opportunity to have a fun time enjoying some really great movies,” said Joshua Wallace, STC Pecan Campus librarian. The schedule includes “Hero” on Oct. 5, 2011, “Kung Fu Hustle” on Oct. 12, 2011, “Eat Drink Man Woman” on Oct. 19, 2011, and “Saving Face” on Oct. 26, 2011. For more information contact Joshua Wallace at 956-872-2623 or jjwallac@southtexascollege.edu, or contact Esther Garcia at 956-872-6485 or egarcia10@southtexascollege.edu.